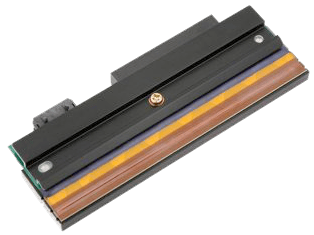 The Datamax I Class 4206, 4208 & 4212 Printhead is sensitive to static electricity, which can damage the printhead or reduce its life. Ground yourself by touching some metal, such as printer’s metal base, before touching the printhead. Clean the printhead to remove any salt or oil left from handling prior to operation. 1. Turn power switch off, unplug the power cord. 2. Open the right/top cover of the printer. 3. Open the printhead assembly by using the right side plastic lever. 4. Loosen the print head mounting screw, which is located on the top of the printhead assembly. Loosen the screw only until it is free from the threads of the printhead releases. 5. Remove the media and ribbon. 6. Carefully unplug the printhead cables from the printhead. 7. Attach the printhead cable to the new printhead. 8. Slide a new printhead into the printhead assembly. Printhead will be aligned to the two mounting pins on the printhead matching mounting holes. 9. Tighten the printhead mounting screw. 10. Reinstall the media and ribbon. 11. Firmly push printhead to close and lock the printhead assembly. 12. Close the printer right/top side cover. Plug in the power cord and turn the power switch on.